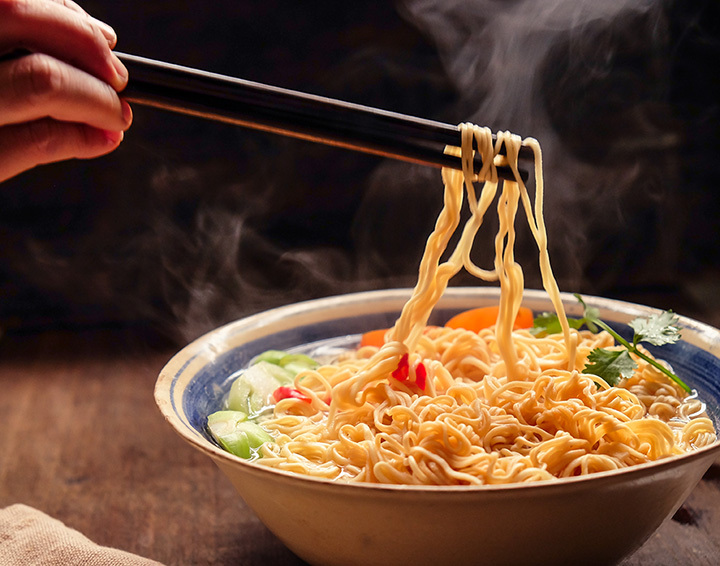 A hot plate of noodles is a staple cuisine in a multitude of cultures. And in Michigan, you’ll find them deliciously prepared in a variety of ways. From savory ramen to spicy stir fry, you’ll surely find something to please your palate. Here are the 10 best noodle places in Michigan. Battle Creek's Umami Ramen was created by a native Thai named Peecoon Allen who moved to the United States later on. Joining in the cooking process from early girlhood, Allen developed a range of skills that made her formidable in cross-cultural cooking. Start with four different noodles—rice, udon, ramen or veggie noodle—and add proteins, a type of broth, seasonal vegetables and a garnish to create a noodle dish that's just to your taste. It's been called “East Lansing's Best Ramen Bar,” and with a name like that, it's got quite a bit to live up to. Home to the Orochon Challenge—a double serving of Orochon but laden with spices—there's a lot else on hand here too. In the mood for a noodle breakfast? They've got you covered with the Breakfast Mazemen. From Sapporo Miso to Tokyo Shoyu, you'll find a wide range of noodle combinations here, including several you never imagined possible before. In Ann Arbor, the Tomokun Noodle Bar offers up two great options to cover your desires. Not only can you get access to a noodle bar, but you can also hit up a Korean barbecue option in the same place. The noodle bar offers pho, udon, rice noodles, and ramen for noodles, with a variety of toppings in each class of noodle. Beyond that, the noodle bar offers donburi—similar to an omelet with more vegetables—as well as stir-fry options and several drinks. Hop Sheing Noodle House in Lincoln Park will open up a lot of new options for the adventurous noodle enthusiast. Six soups and seven stir-fry options—including a noodle-less alternative for the lot that promises “twice the veggies, none of the carbs”—all adorn the menu, as well as a build-your-own option that offers your choice of meats and vegetables to build a noodle dish your way. Not surprisingly, there are plenty of noodle options in Detroit, and Ima might be one of the leading ones in town. A good variety of noodles awaits you here, and all noodle dishes are served with scallion, nori and gai lan. From there, things get interesting. Check out the Forest Udon that boasts porcini broth, sesame tofu, smoked trumpets, rosemary, and garlic oil. Rice bowls are also on hand for those who'd rather keep their grains shorter and in piles, and a variety of beverages, kids' meal options, and even some desserts rounds out the menu at Ima. The best part about Grand Rapids' Fuji Yama Asian Bistro is that you can get a look at the noodle throughout large portions of Asia. Singapore rice noodles are on hand, as well as a couple breeds of Pad Thai. Both China and Japan are also in play with lo mein and yaki udon/soba. That's a lot of noodle, and if you want to branch out from the noodle you'll find a range of options awaiting you from dinner hibachi to bento boxes and just about anything in between. Even Marquette is getting in on the noodle rush in Michigan with its Thai House restaurant. You'll have a variety of noodle-based choices here, including drunken noodles, and golden noodles, which boasts egg, meat, and a range of vegetables. Naturally, Thai House won't stop there, so come prepared for a wide variety of options. The Sagano Japanese Bistro actually includes noodles with any steakhouse lunch menu item, from chicken to shrimp to scallops, and that's just a start. Specific noodle dishes feature both soba and udon, with a range of toppings, and those who want to go beyond the noodle will be accommodated here as well. We'll double back to Ann Arbor for this one, mainly because we couldn't fail to mention a restaurant named the “Slurping Turtle.” The noodle options at the Slurping Turtle are all contained in a part of the menu known as “slurps,” and there are slurps aplenty. Start with Tokyo Shoyu, check out a few different kinds of ramen, a couple of stir fry options, and a particularly spicy miso tonkotsu. That alone is a great lineup, but that's just where you start at the Slurping Turtle. Finally, we have Asian Noodle, Bay City's entry into the noodle stakes. A range of noodle soups is the focus here, starting with Pancit Mami—an egg noodle soup—and seguing into something called Beef Noodle Soup, which features “bean thread noodles.” The Sotanghon Bola-Bola, meanwhile, boasts “transparent noodles” with meatballs made with ground pork, a unique but exciting selection. There's more to Asian Noodle than noodles, of course—they've actually got a Filipino Burger that boasts sausage and pineapple—but since it's right in the name, you know noodles are a big focus here.